Soft X-ray spectrometer onboard Hitomi X-ray satellite observed Perseus cluster of galaxies. 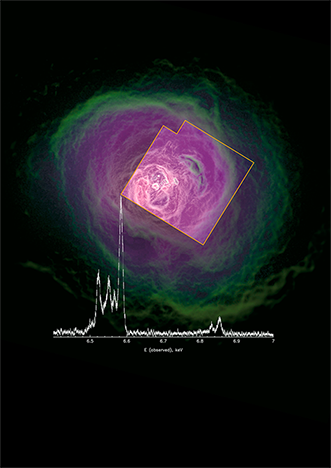 X-ray image of Perseus cluster (color) and spectrum of iron line taken by Soft X-ray Spectrometer onboard Hitomi (white). It is discovered that the hot gas in the central region is "quiet", although jets from the central super-massive blackhole collide with the hot gas. This result will be released to Nature online. For the detail, please check JAXA.